It's the last Creative Connection of 2010! It's time to create a web of art which stretches to all kinds of wonderful places in the blogosphere! This month's Creative Connection asks you put on your party hats! Put a party hat into your creation and then link up to us! Let's see how far we can get the party spirit to spread! Then, come back and leave a comment here on the blog post so we can see all the gorgeous art that you have created! Please note: to participate in this event, your blog post's main focus must be the Creative Connection. 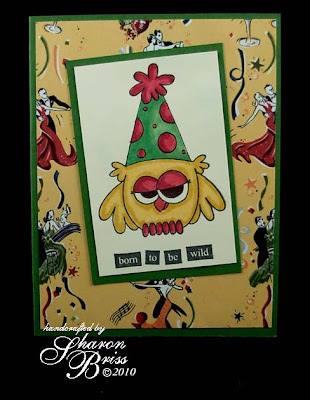 To get us started, Sharon has created a silly sample to inspire you! Let's see how far we can get our Only One Creative Connection to go! As we say goodbye to 2010, we also are saying a fond farewell to one of our Gingers, Katy Fox. Katy demonstrates such a wonderful range of styles and techniques in her art. From fresh and fun scrapbook layouts to amazingly beautiful and delicate cards, Katy wows us on a regular basis. Her sense of design and her amazing use of color and texture is captivating. But, you don't have to take my word for it! Take a look yourself! 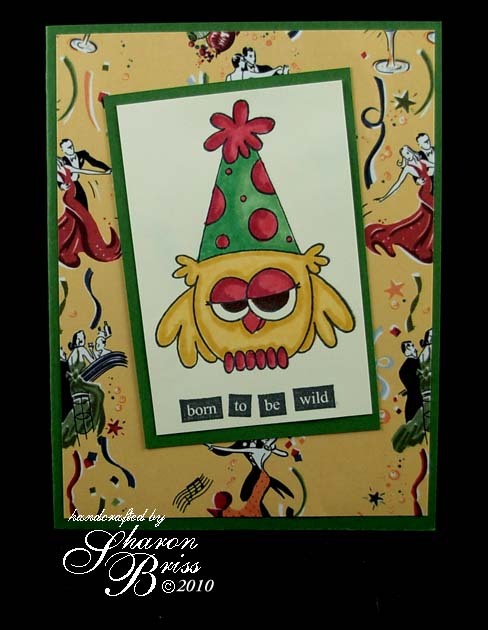 While her art will be missed on Gingersnap Creations, you can keep up with Katy on her blog, Postcards from the Attic, and in CraftStamper magazine. We wish Katy all the best and a future of wondrous creativity, fabulous adventures and amazing art! 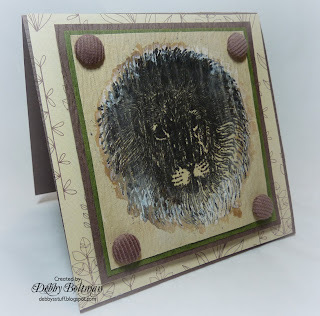 After the fabulous tutorials from Sharon, Jo and Debby, I want to share with you some bleach effects when using different types of stamps (rubber, foam and clear stamps) and papers (colour and texture). * Bleach can have quite a strong chemical smell, if possible use it in a well-ventilated area. * It is useful to cover your work area well with lots of newspaper and to cover yourself with an apron. * Please wash all the equipment which came into contact with bleach straight afterwards. This is my equipment for the experiment. I used an old plastic container lined with paper towels as bleach stamp pad. Only a small amount of bleach is necessary to soak the paper towels. If there is too much bleach on the stamp, it will show ... it will all be bubbly. Just stamp it off on some newspaper. 1 All stamps worked well whereby the rubber stamp (middle) gave the sharpest image, the foam one (left) the boldest. The more fibrous the paper is, the fuzzier the bleached image (left). Handmade paper with natural dyes (right) lost the colour and showed the natural fibres underneath. The more textured the paper is, the more incomplete is the bleached image (second from right). Glossy shiny and patterned papers didn't bleach at all. I achieved the best results with the light textured card above (second from left, 220 gsm) and Bazill card using the smooth side (below). 3 For the colour test I chose Bazill card (top) and recycled card. This was really interesting, I had imagined that the bleach effect would be deepest on dark paper ... well, I was sort of not quite right. Each colour, each different paper texture gives its own interesting bleach efffect. 4 I overstamped a couple of images (Brilliance ink) which gave a nice batik effect ... begging to be used as background, in individual pieces ... the possibilities are endless. Thanks for stopping by. Hope you give it a try and show us your creations! Happy bleaching, Petra. I thought it would be fun to highlight a majestic image with bleach. So, I gathered my materials: Bleach pen. old disc for palette, old brush, embossing powder, Versamark and my majestic image, Lion from Hearts In Touch #85 Wild Animals Sheet. 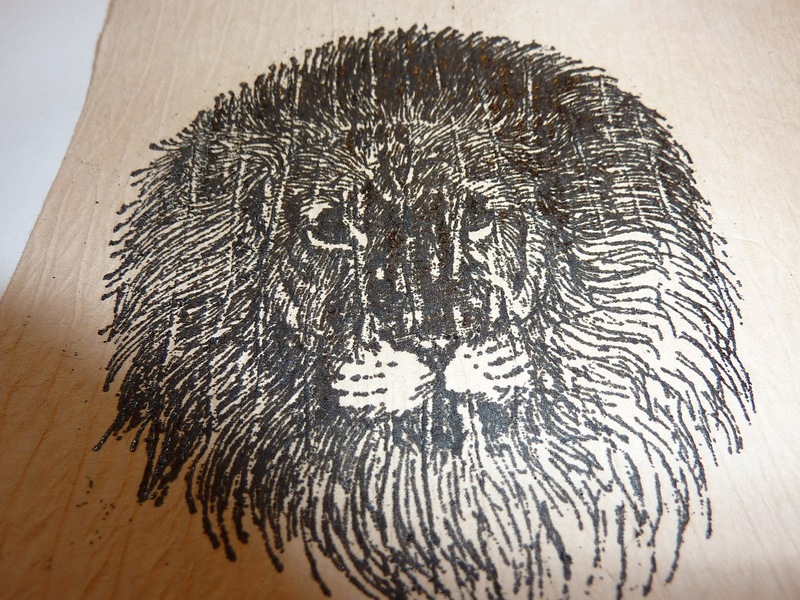 I stamped the image with Versamark onto Safari Brown Skinny Column cardstock. 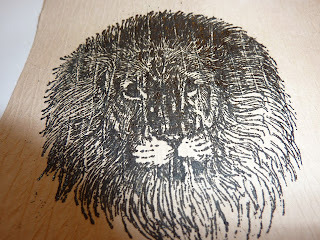 Then sprinkled black embossing powder on the image and heat set. I dabbed some bleach from the bleach pen on to my palette. 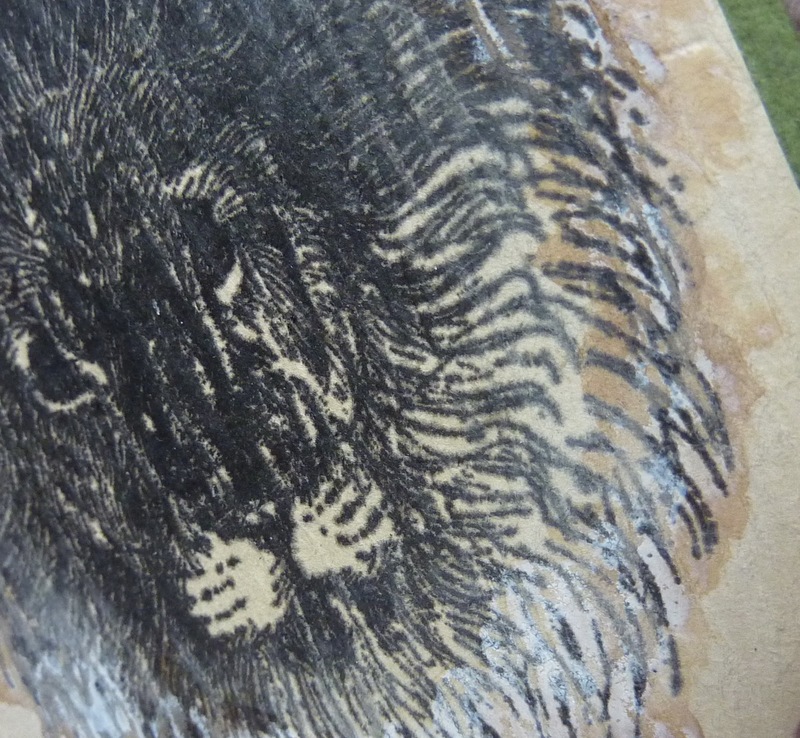 Dipped the brush in and tried to grab a good amount of bleach on my brush and began dabbing around the Lions head to bleach the paper and highlight the image. You can wait for the paper to change or be impatient like I am and give it some heat to change color quicker. And added more bleach to certain areas in the process. And sanded where I thought the bleach effect was too thick. Thanks for stopping by and I look forward to viewing your bleach creations! Welcome to the wrap-up for the Vintage Hues challenge. We had over 60 beautiful vintage inspired entries, including lots of our previous Visiting Artists and Muses. Enjoy! Congratulations, Libeeti. Your artwork will be showcased on the Home Page of the Gingersnap Creations Yahoo Group as well as on the sidebar on the blog. Now, onto our fabulous Ginger Gems. When each challenge closes, we also pick 7 Ginger Gems - fabulous creations that we feel really exemplify that challenge's objective. The Ginger Gems appear in a slide show in the blog sidebar for the entire week, as well as in this wrap-up post, and their creators have the honor of displaying this Ginger Gems blog badge. We hope you'll take a minute to stop by the Gems' blogs and congratulate them! Come back tomorrow for a new Color Challenge. I have, however, got a lot of tags for Christmas presents! Following on from Mr Holtz's 12 tags of Christmas, I have been using his inspiration to make a few more .. and I have made one especially for Gingersnap Creations too! I guess this would be great for anytime of the year, just not for Christmas! 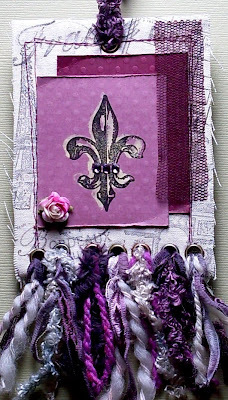 To make it you will need, distress inks; clear embossing powder; a few swirly stamps (these are from The Artistic Stamper); a Manila tag #8; a rosette die or similar; some mini tinsel; old music sheet; and some glue. I used a glue gun, but a strong glue will work just as well. I stamped up the swirls in clear distress embossing ink, and then embossed in clear embossing powder. Distress ink the tag with shades of blue, and allow to dry. To make the rosettes, I glued old music sheets onto some thicker paper as I found it tore when running it through the rosette die. Ink up the paper before die cutting it. I used Distress ink direct to paper. Saves faffing about! Make a rosette up using a hot glue gun, and add mini tinsel to the back using glue. Add a coil of tinsel to the centre of the rosette. Glue to the tag. You could edge the rosette with a gold dabber, and I meant to do this, but forgot! I do hope you enjoy this project, and if you are making tags please do show me yours!! Merry Christmas and a Happy and Prosprous New Year! Welcome to this month's Technique Workshop. Our archives are filled with dozens of great tutorials written by our talented Design Team and guest artists. Each month, we will revisit one of these posts and put it back in the spotlight. This month I chose Penny Bennington's wonderful Ceramic Tile Tutorial. Penny decorated plain ceramic tiles using alcohol inks, tissue paper and stamps, and then made them into beautiful books (one of which I'm lucky enough to own). I've been itching to try the technique since I first read the tutorial back in July. Instead of making books, I opted to make my tiles into hangings. I used two sizes of white tile - some subway tiles left over from our bathroom remodel measuring 6" x 3" and a larger 8" x 8" kitchen tile. Following Penny's instructions, I colored the plain ceramic tiles with different colored alcohol inks and blending solution. I stamped several images on tissue paper and spread a thin layer of Glossy Accents on the dry tile with an old brush. I carefully placed the tissue onto the tile and brushed on a further layer of Glossy Accents. I then broke out the Glimmer Mist, sprayed the white tissue paper and allowed it to dry before stamping my images with Stazon. My thoughts then turned to the Glossy Accents, what if I embedded things into the top layer while it was still wet? I added glass glitter to the edges of the angel tile. This Simple Things tile has pale pink Glimmer Mist on the tissue, silver alcohol ink around the edges and dew drops embedded in the Glossy Accents along the bottom edge. I gave the final tile a big shot of sparkle by painting the entire surface of the dried tile with shimmer paint (sorry it doesn't really show up well in the photos). I could make these tiles all day - they're so much fun! How about using colored tissue paper or decorative napkins? How about embedding beads into the Glossy Accents or sprinkling the wet surface with Pearl-ex? The possibilities are endless. Have fun!